The market mood is much more positive Wednesday. Deadly terrorist bombings in Brussels gave investors a scare on Tuesday. But markets as a whole have become increasingly resilient in the face of terror attacks. 1. Time for a rebound: All major European stock markets are stepping up in early trading. Shares in hotel and airline companies plunged on Tuesday but are bouncing back Wednesday. Shares in InterContinental Hotels (IHG) are rising by about 1%, and airlines Ryanair (RYAAY) and EasyJet (ESYJY) are also higher. 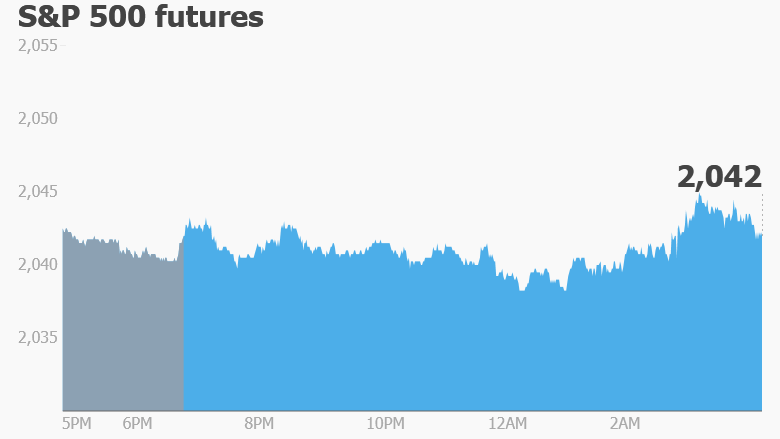 U.S. stock futures are holding near Tuesday's closing levels as the U.S. dollar strengthens against major currencies. Most Asian markets ended the day in the red, but the losses weren't dramatic. The commodity market isn't faring so well. Oil, gold, aluminum and copper prices are slipping a tad. Gold and oil prices have staged dramatic rallies over the past few weeks. 2. Try harder: Shares in Nike (NKE) look set to drop at the open after it reported quarterly results after the closing bell. The sports apparel company reported sales growth of 8% and net income up 20% from the same period last year. But it seems investors had been expecting better. 3. More market movers -- Credit Suisse, Gilead Sciences: Shares in Credit Suisse (CS) are rising in Europe after the bank said it was accelerating its cost cutting drive. Shares in Gilead Sciences (GILD) are set to drop at the open as Bloomberg reports that a court issued an unfavorable verdict for the company. Merck (MRK) reportedly won a case that allows it to seek royalty payments from Gilead for hepatitis C drugs. 4. Earnings and economics: General Mills (GIS) is one of the main companies reporting earnings Wednesday. Results will come before the opening bell. Traders will also be watching for some key pieces of economic data. The U.S. Census Bureau is reporting February new home sales at 10 a.m. ET. And the U.S. government releases its weekly crude oil inventory data at 10:30 a.m.